German Luxury refiner DMC’s just celebrated its 5 year anniversary in Hong Kong. 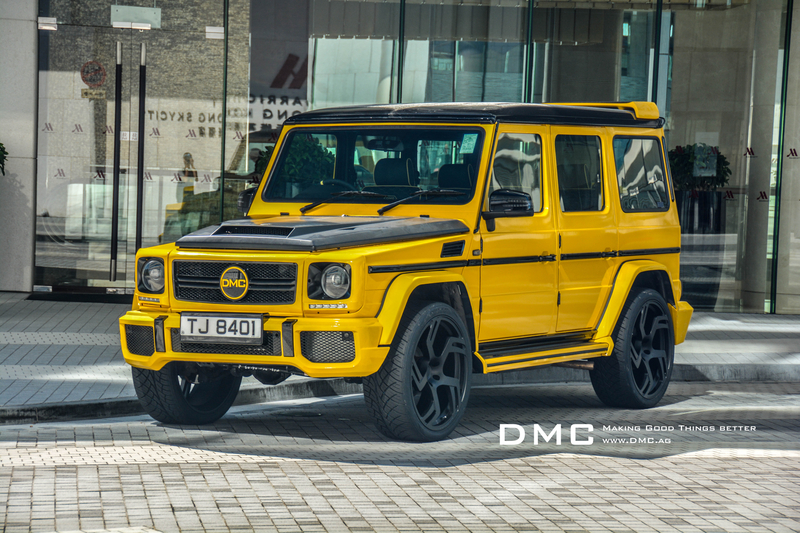 We will cover the event in a separate press release, today let’s focus on the company’s latest creation: The Limited Edition DMC G88 G Class, 5 of 5, was launched at the event to celebrate the tuner’s achievement. DMC is a well known Lamborghini specialist. But the designer’s expertise has grown in the past few years, covering other exotics such as Ferrari, McLaren and even Bentley or Rolls Royce. By launching a refinement program for the Mercedes Benz G500/G65 AMG, they opened a new chapter last year. It has always been DMC’s focus to develop new body elements, that stay in line with the original design. 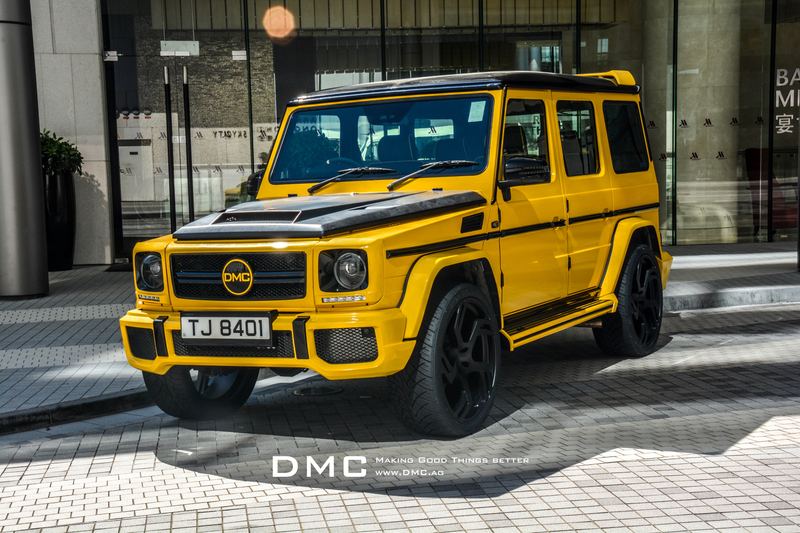 The very same concept was applied to this new creation, making the DMC Gelaendewagen to a real eye catcher in the street. A vented front hood is not only responsible for improved performance and ventilation, it’s also the car’s prime styling component. Manufactured from pure dry carbon, it adds the necessary elegance to make the DMC “EXTREM” stand out from other G’s. On the rear we can find a roof spoiler plus an aero wing that sits on the aforementioned. These components continue to underline the aggressive look of the car while completing the look, and are naturally made of dry carbon fiber as well, just like the bonnet. There is also a cover for the spare-tyre box. Naturally it’s made of dry carbon fiber as well, and prominently bears the DMC logo in its centre. 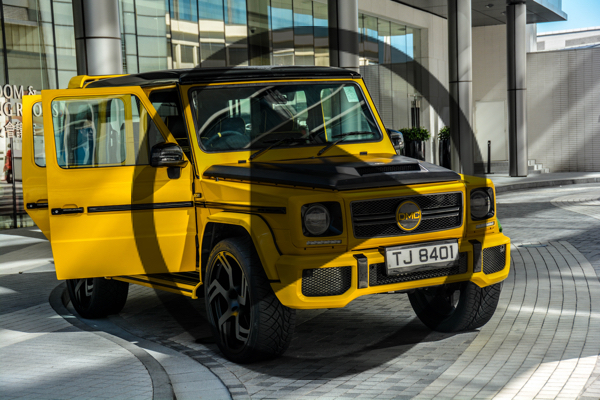 If the client’s car is a non-wide body G500, the tuners offers a set of wider wing fenders and bumpers as well, to create the desired masculine appearance. Completing the visual styling, DMC offers a variety of forged alloy wheels. Suggested sizes range from 23” to 25”, which are usually equipped with a set of Pirelli P-Zero tyres. Dimensions start from 305/30/23 but can be adjusted for the client’s personal wheel size. They are available in either Monoblock or 3-PCS design, either of which will totally change the exclusive design of the car. The car shown features an impressive 24″ setup. The sporty look is supported by a performance upgrade under the bonnet. 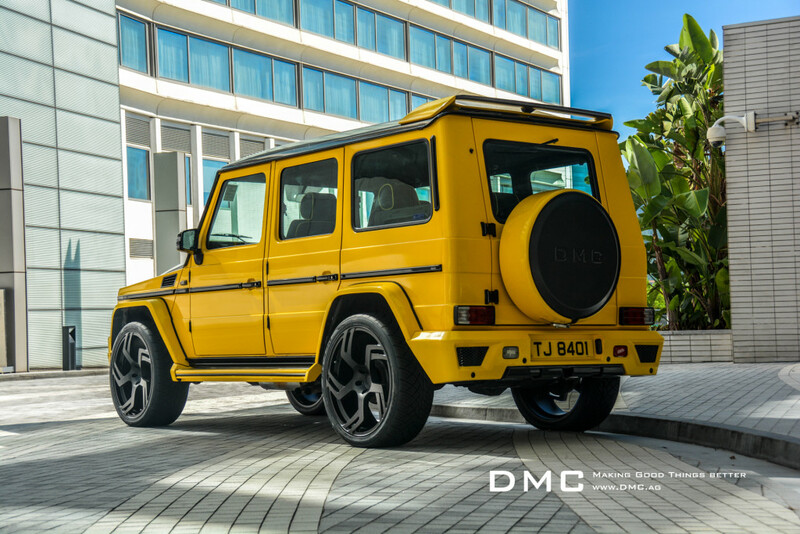 DMC used all their experience from Italian sport car tuning and installed a whole new array of components to make the G stand out in the crowd. The engine receives new pistons, connections rods, bearings, crankshaft, you name it – it’s there. Now it becomes clear why the Germans had to redesign a vented front hood, the monster engine’s heat has to go somewhere afterall. In addition with the new exhaust system, the DMC G truly earns it’s new “G88 EXTREM” name by nearly doubling (!!) its performance from 385 hp (285 kW) to an insane 700 hp (515 kW). After the amazing body kit and the breath taking power upgrade, the engineers had to leave some space for comfort. As usual, DMC offers the option that the interior can be tailor made to meet the exclusive clientele’s demands. From the company’s favourite material Carbon Fiber, to rare and fine leathers like Ostrich and Stingray, there’s nothing that can’t be achieved. The sky is the limit and if you can imagine it, the refiner will find a way to make it happen. This particular model in Hong Kong is a 1992 Classic. It has been imported from a Japanese owner who collects Mercedes from that era. 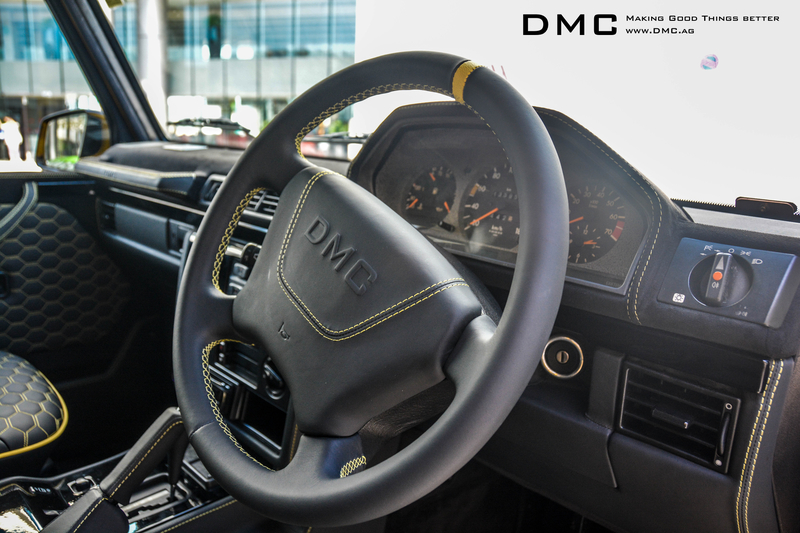 DMC applied a combination of leather and alcantara, mostly black with yellow trims and stitches. Suffice to say that the car has been transformed dramatically. 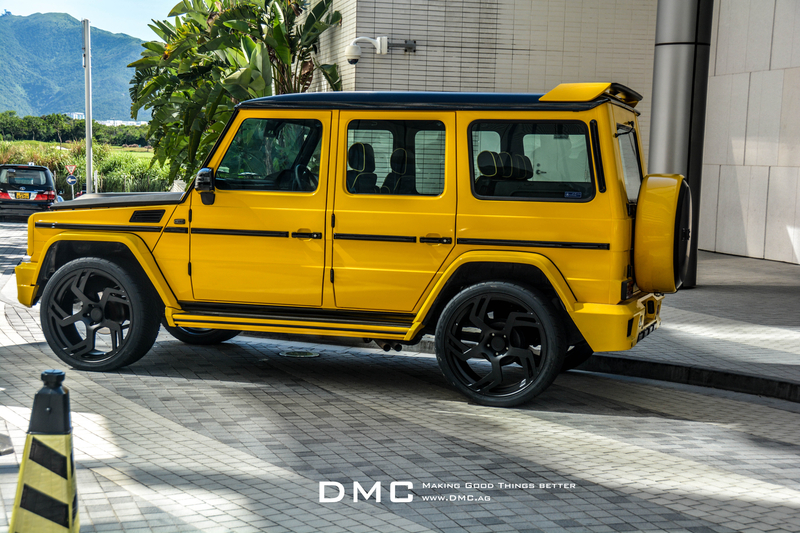 It’s this particular color combination, that can be seen on the interior as well as exterior, that sets this DMC G88 Limited Edition apart from it’s normal DMC G siblings. Only 5 cars will receive this particular treatment, one for each year of DMC’s operations. On top of that, each one will be made in a different color, so each client will truly be unique in this world. Guests that attended the 5 year anniversary party, seemed to like the rather extravagant yet muscular appearance of DMC’s interior.